The environmental impact of mining includes erosion, formation of sinkholes, loss of biodiversity, and contamination of soil, groundwater and surface water by chemicals from mining processes. Besides creating environmental damage, the contamination resulting from leakage of chemicals also affect the health of the local population. Mining companies in some countries are required to follow environmental and rehabilitation codes, ensuring the area mined is returned close to its original state. Some mining methods may have significant environmental and public health effects. Nuss and Eckelman (2014) provide an overview of the life-cycle wide environmental impacts of metals production associated with 62 metals in year 2008. Mining can have adverse effects on surrounding surface and groundwater if protective measures are not taken. The result can be unnaturally high concentrations of some chemicals, such as arsenic, sulfuric acid, and mercury over a significant area of surface or subsurface. Runoff of mere soil or rock debris -although non-toxic- also devastates the surrounding vegetation. The dumping of the runoff in surface waters or in forests is the worst option here. Submarine tailings disposal is regarded as a better option (if the soil is pumped to a great depth). 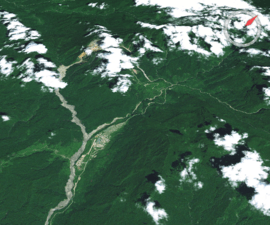 Mere land storage and refilling of the mine after it has been depleted is even better, if no forests need to be cleared for the storage of the debris. 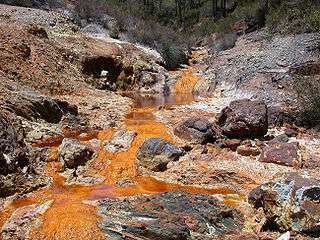 There is potential for massive contamination of the area surrounding mines due to the various chemicals used in the mining process as well as the potentially damaging compounds and metals removed from the ground with the ore. Large amounts of water produced from mine drainage, mine cooling, aqueous extraction and other mining processes increases the potential for these chemicals to contaminate ground and surface water. In well-regulated mines, hydrologists and geologists take careful measurements of water and soil to exclude any type of water contamination that could be caused by the mine's operations. The reducing or eliminating of environmental degradation is enforced in modern American mining by federal and state law, by restricting operators to meet standards for protecting surface and ground water from contamination. This is best done through the use of non-toxic extraction processes as bioleaching. If the project site becomes nonetheless polluted, mitigation techniques such as acid mine drainage (AMD) need to be performed. Acid rock drainage occurs naturally within some environments as part of the rock weathering process but is exacerbated by large-scale earth disturbances characteristic of mining and other large construction activities, usually within rocks containing an abundance of sulfide minerals. Areas where the earth has been disturbed (e.g. construction sites, subdivisions, and transportation corridors) may create acid rock drainage. In many localities, the liquid that drains from coal stocks, coal handling facilities, coal washeries, and coal waste tips can be highly acidic, and in such cases it is treated as acid rock drainage. The implantation of a mine is a major habitat modification, and smaller perturbations occur on a larger scale than exploitation site, mine-waste residuals contamination of the environment for example. Adverse effects can be observed long after the end of the mine activity. 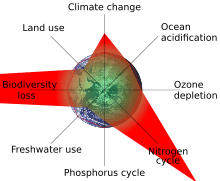 Destruction or drastic modification of the original site and anthropogenic substances release can have major impact on biodiversity in the area. Destruction of the habitat is the main component of biodiversity losses, but direct poisoning caused by mine-extracted material, and indirect poisoning through food and water, can also affect animals, vegetals and microorganisms. Habitat modification such as pH and temperature modification disturb communities in the area. Endemic species are especially sensitive, since they need very specific environmental conditions. Destruction or slight modification of their habitat puts them at the risk of extinction. Habitats can be damaged when there is not enough terrestrial as well by non-chemicals products, such as large rocks from the mines that are discarded in the surrounding landscape with no concern for impacts on natural habitat. Bioaccumulation plays an important role in polluted habitats: mining impacts on biodiversity should be, assuming that concentration levels are not high enough to directly kill exposed organisms, greater on the species on top of the food chain because of this phenomenon. Adverse mining effects on biodiversity depend to a great extent on the nature of the contaminant, the level of concentration at which it can be found in the environment, and the nature of the ecosystem itself. Some species are quite resistant to anthropogenic disturbances, while some others will completely disappear from the contaminated zone. Time alone does not seem to allow the habitat to recover completely from the contamination. Remediation takes time, and in most of the cases will not enable the recovery of the diversity present before the mining activity. Animals can be poisoned directly by mine products and residuals. Bioaccumulation in the plants or the smaller organisms they eat can also lead to poisoning: horses, goats and sheep are exposed in certain areas to potentially toxic concentration of copper and lead in grass. They are fewer number of ants species in soil containing high copper levels, in the vicinity of a copper mine. If fewer ants are found, chances are great that other organisms leaving in the surrounding landscape are strongly affected as well by this high copper levels, since ants are a good environmental control: they live directly in the soil and are thus pretty sensitive to environmental disruptions. Humans are also affected by mining. There are many diseases that can come from the pollutants that are released into the air and water during the mining process. For example, during smelting operations enormous quantities of air pollutants, such as the suspended particulate matter, SOx, arsenic particles and cadmium are emitted. Metals are usually emitted into the air as particulates. There are also many occupational health hazards. Most of the miners suffer from various respiratory and skin diseases. Miners working in different types of mines suffer from asbestosis, silicosis, black lung disease etc. 1 2 3 4 5 Niyogi, Dev K.; William M., Lewis Jr.; McKnight, Diane M. (2002). "Effects of Stress from Mine Drainage on Diversity, Biomass, and Function of Primary Producers in Mountain Streams". Ecosystems (5): 554–567. ↑ Kimura, Sakurako; Bryan, Christopher G.; Hallberg, Kevin B.; Johnson, D. Barrie (2011). "Biodiversity and geochemistry of an extremely acidic, low-temperature subterranean environment sustained by chemolithotrophy". Environmental Microbiology. 13 (8): 2092–2104. doi:10.1111/j.1462-2920.2011.02434.x.